Posted on 12, April 2019 by EuropaWire PR Editors | This entry was posted in Aviation & Aerospace, Germany, Industrial, News, Technology, Transportation & Logistics and tagged blisk, BR725, components, Dr Holger Cartsburg, engines, Oberursel, Pearl 15 engine, Rolls-Royce, TP400, Trent 1000 TEN, Trent 7000, Trent XWB. Bookmark the permalink. OBERURSEL, Germany, 12-Apr-2019 — /EuropaWire/ — Rolls-Royce Oberursel factory reaches another milestone as it shipped out its 10,000th blisk. Blisks (blade integrated disks) comprised of both rotor disk and blades are highly complex components. 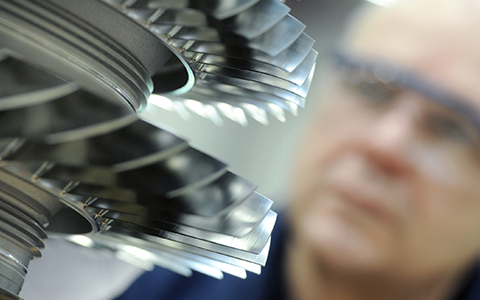 Oberursel is the Centre of Excellence for the production of these high-tech components for the whole Rolls-Royce group. Today’s highly fuel-efficient engines rely on blisks. The first three stages of the high-pressure compressor of the Trent XWB, use them. The use of these aerodynamically advanced components reduces the weight of the high-pressure compressor by around 15%, which makes a significant contribution to the reduction of the Airbus A350 XWB’s fuel consumption and thus its CO2 emissions as well by around 25% compared to the previous generation. Oberursel started production of blisk in 1997, and it has grown continually ever since. Today the factory manufactures blisks for the TP400, BR725, Trent XWB, Trent 1000 TEN, Trent 7000 and Pearl 15 engine types.